Chihuahuas have been winning the hearts of dog lovers for decades and with that comes more pet parents asking; what is the best dog food for my Chihuahua? On NolongerWild, we are going to cover some facts about what a Chihuahua needs in a diet and the best foods that will meet those demands. 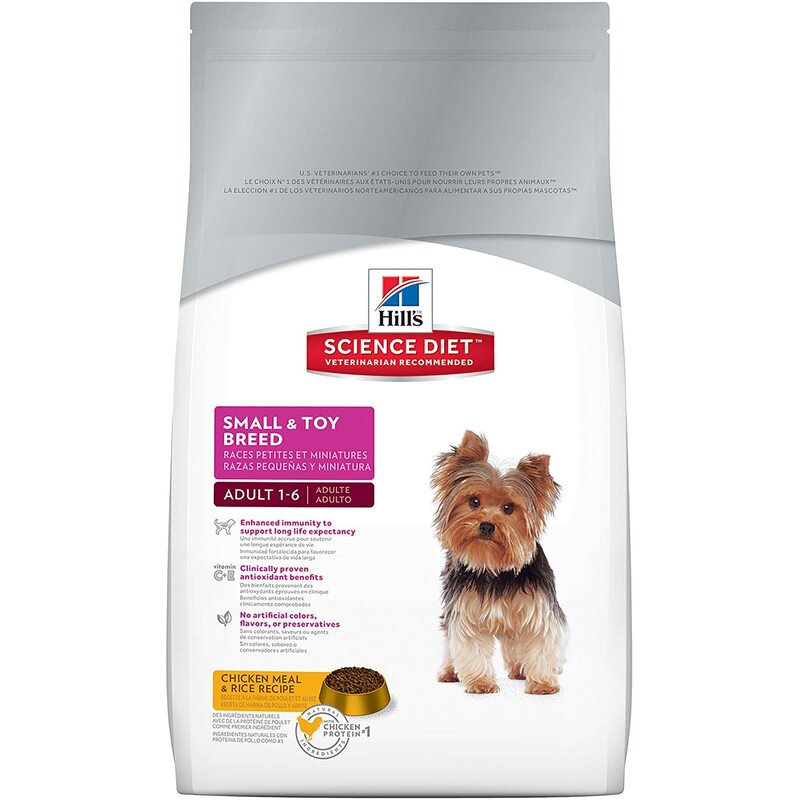 With more than 220 veterinarians and other pet professionals working to produce a quality recipe, Hills Science Diet Toy & Small Breed, is formulated for the needs of your Chihuahua. Its protein profile includes chicken and chicken liver with brewers rice and cracked barley as part of the carbohydrate makeup. The addition of carrots, spinach, and other healthy all-natural ingredients puts this small breed food as one of the top brands on the market today. Formulated with their very own Nutro DNAdvantage, this small breed food uses a unique blend of natural antioxidants to help support your Chihuahua's immune system. 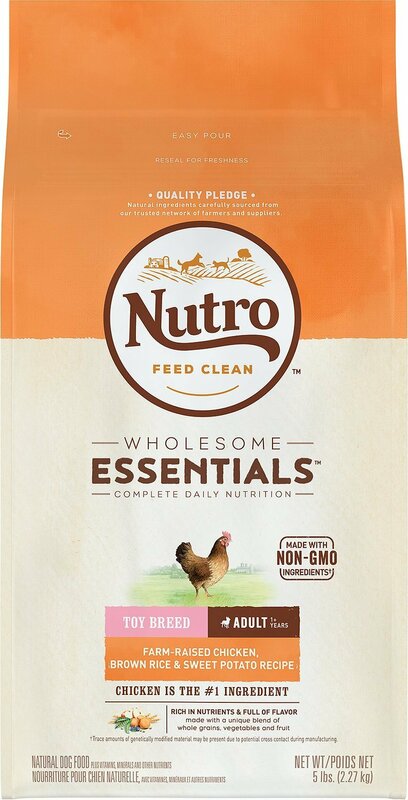 Nutro has also enlisted the use of only farm-raised chickens with a balanced level of Omega-6 fatty acids, zinc and B vitamins for a healthy shiny coat. In addition, it uses whole brown rice and oats for carbohydrate sources and the kibble is designed to naturally reduce plaque and tartar buildup for a healthier mouth. 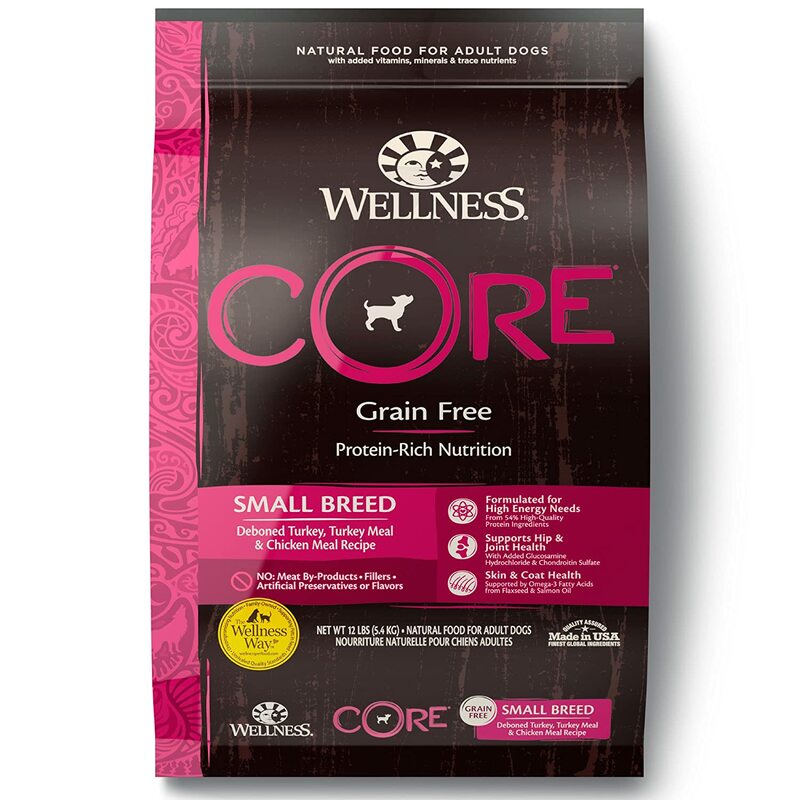 Made and sourced from the USA, Wellness Core Grain Free dog food may be a good choice for your Chihuahua. Made with lean chicken and turkey, this brand provides 80% more protein than other brands of dog foods which still contain grains. This food does not use any wheat, corn, soy, meat by-products, artificial colors, flavors or preservatives - perfect for those dogs that may suffer from food allergies. In addition, the Wellness brand has made sure all this goodness is packed into a small kibble that your Chihuahua will have no problem "sinking her teeth into." 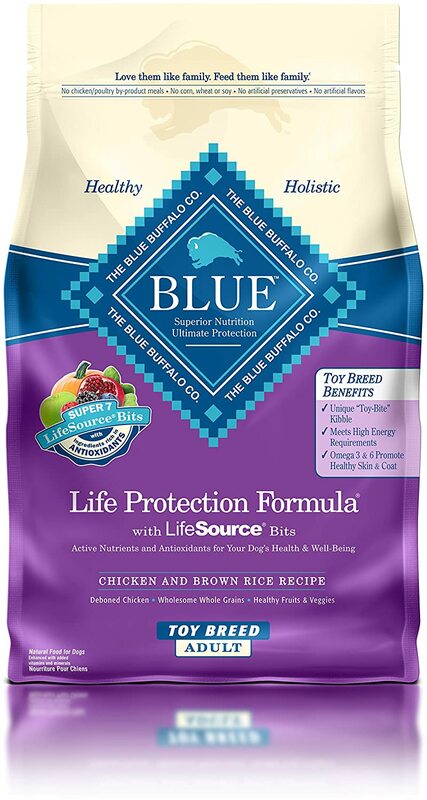 Our number one spot for the best dog food for Chihuahuas goes to the Blue Buffalo Life Protection brand. Blue Buffalo has raised the bar on what a dog food recipe should contain and is leading the pack on quality ingredients. The protein is sourced from de-boned chicken and the carbohydrates needed for optimal energy levels is from those healthy whole grains (no cheap fillers here). The addition of fruits and veggies increase the antioxidant levels in the food and also provide those extra vitamins and minerals to help keep your Chihuahua in top shape. And of course like all Blue Buffalo products, it's made and sourced from the USA. Why Do Chihuahuas Need "Special" Food? Even though Chihuahuas are small dogs, they can burn calories very quickly, for this reason, your pooch will need a different diet than their bigger dog counterparts. This breed is also built to digest protein so you will want your choice of dog food to have at least 25% lean protein. To help you gauge your Chihuahua's diet it is helpful to know that the average 5 pound Chihuahua, with a moderate activity level, will need approximately 200 to 250 calories per day. Of course, not all Chihuahua's weight 5 pounds, so as a general rule-of-paw, this breed needs about 40 to 50 calories per every pound of body weight to help him metabolize and sustain his energy levels throughout the day. Protein - at least 25% of a good quality protein sourced from lean meats like chicken, venison, fish, and bison. Avoid meat meals and unidentified meat sources. Complex Carbohydrates - these should be sourced from sweet potatoes, and brown rice. Avoid corn. Fruits/Veggies - the food should be rounded out with healthy fruits and veggies like carrots, peas, apples, cranberries etc. These provide antioxidants and the added vitamins and minerals your pet will need for a healthy life. Healthy Fats - these should be sourced in the form of Omega 3 and Omega 6. Like any other canine, Chihuahuas can experience health issues due to a poor diet. These can include a rough coat that sheds a lot, a weakened immune system, dental issues and even obesity. In addition, Chihuahuas are prone to diabetes or more specifically hypoglycemia. This is a condition that makes your dog's blood sugar levels drop. Providing your Chihuahua with the best possible diet will help you avoid these unpleasant conditions in your pet. 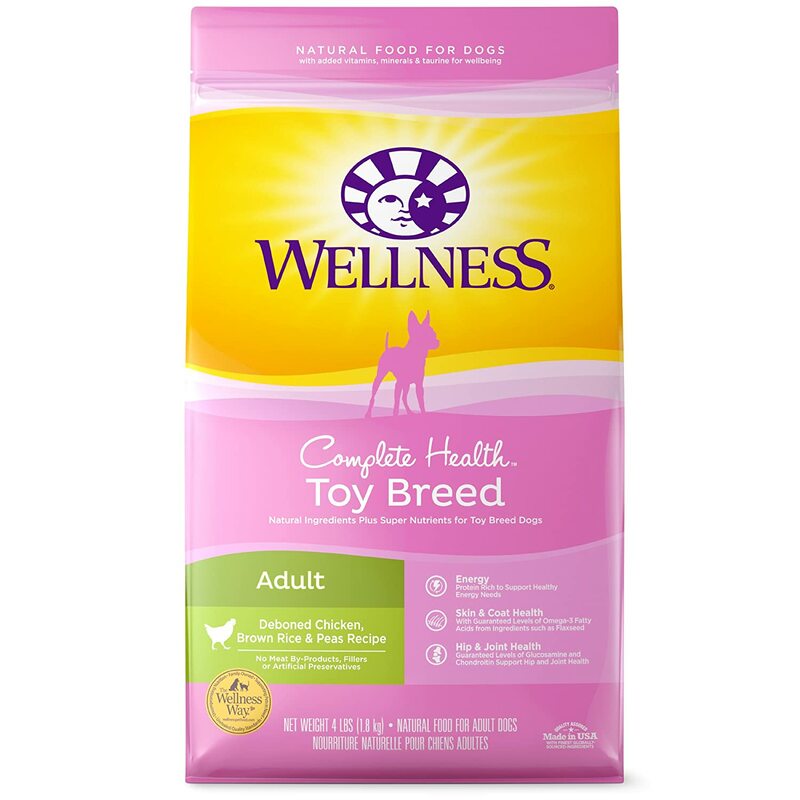 The Chihuahua's high energy levels and the need for a good quality protein make finding the best dog food for your small pal vital to having a healthy pet. Try out one of our top picks to see the difference a good quality kibble can make in your dog's life.